Texas Tech is a top-ranking University offering degrees in more than 150 courses. It has a student enrolment of 36,500 and a strong reputation in the fields of epidemiology, pulsed power, grid computing, nanophotonics and atomospheric sciences. Almost 80% of students will have contact with the University’s office of Student Financial Aid and Scholarships. It’s here that thousands of applications for loans, grants and scholarships are received and processed. This mammoth administrative task is managed by Supervisor Nikki Sosa, supported by her 60-strong team. Together they provide the essential service of linking student, agency and financial organization together, allocating funds, awards and scholarships. At the Lubbock Campus, in north west Texas, this call-center team responds to a large volume of student enquiries, ranging from the status of a student’s loan application, to how to pay a bill. These enquiries are done either face-to-face on campus, on the phone or through digital channels such as the University’s website or social media channels. Having access to up-to-date information is vital for this busy team, as they strive to answer student enquiries ‘on-the-spot’. At any one time, there are literally thousands of student loan applications in the system. These are processed in batches according to date of submission. Originally, a daily update was sent to all staff via a group email, advising the status of each batch, and other information. But staff found it time-consuming to trawl through their emails and locate the right message. In many cases, these emails got missed completely. If there were further updates during the day, the only option would be to send out an additional email, adding to the inbox clutter. With the team being widely spread and including a mix of full and part-time workers (who may be based remotely at times, for example during Orientation), Ms Sosa needed an easy to implement solution that could be seen by every employee. The University invested in the SnapComms scrolling Desktop Ticker. This useful communication channel displays information via a narrow window of scolling text across the bottom of employees’ screens. Its short snappy format is ideal for conveying the bite-size chunks of information that the University staff need to do their job. Ticker messages can be set to stay on screen permanently until clicked, or to reappear at scheduled intervals. Ms Sosa says most staff prefer to keep the ticker scrolling continuously, as they can refer to it instantly. News-style headlines are updated each day to feature all the relevant information and are sent direct to employees’ screens. “It’s so quick to set up – just a minute or two – and easy to update if required,” explains Ms. Sosa. This helps with multi-tasking – a key skill needed by this busy team. Staff are able to scan the ticker headlines while working within other applications or liaising with students. The narrow text field means their screen real-estate is not compromised. 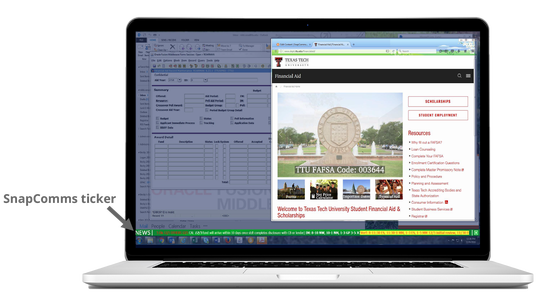 It’s been more than two years since the ticker tool was introduced at the University and has since become an integral part of the team’s communications. Staff refer to the ticker for almost every enquiry, providing an instant response for students. Staff love the fact that they no longer have to dig around trying to find an email, or disturb a colleague to get the right answer. With the ticker, it’s right there in front of them, in a single steady stream.